Hey everyone! 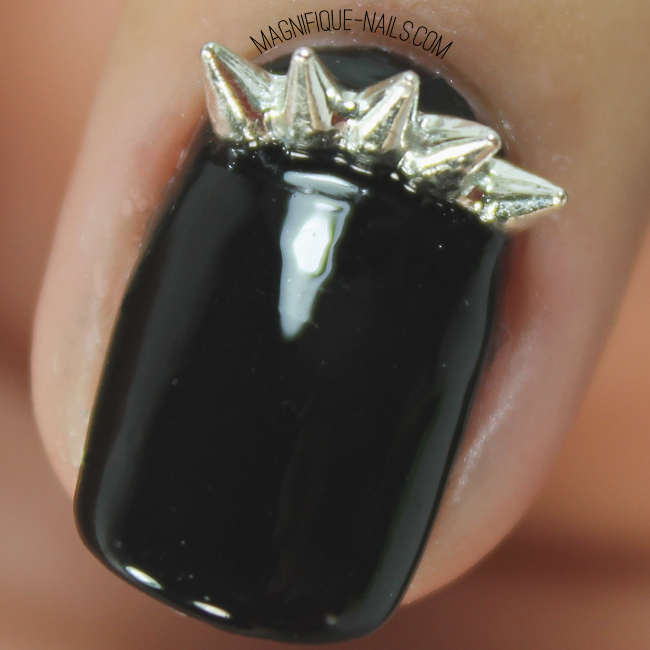 Super excited to show off my nails for today's post, I was dieing to find the right time to try out these amazing spike crown from Daily Charme. I love accenting my nails with nail charms and studs, no matter how cliche they get. I think it gives the nails a little oomph! 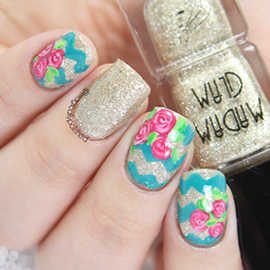 Especially when you have simple nails, just as these. A few days ago I reviewed Bonita Colors Colorful Palette The Artist Collection (part 1 & 2) and loved the colors, specifically one, and thought it would be perfect for a rocking chick nail art design. I really didn't have an inspiration for these, though I can say the stud was inspiration itself. Not only are nail charms are great for an intense nail art, but they work perfectly for those wanting something fun, especially those with no nail art experience. Daily Charme sell tons of different charms, especially these amazing spike crown charm, which I haven't seen elsewhere. Just a simple pairing with a solid shade, makes a huge difference. As for the design, I began by applying two coats of Bonita Salon Dali's Memory and one coat of Madam Glam Black Hole. Once the Polish is completely dried, I first freehand (unless you can also use stripping tape) the v-shape with a stripping brush using Black Hole. For the charm, I applied top coat (for one day wear) and added the charm using tweezers. Lastly, I sealed the design with H K Girl Top Coat, that's it! Overall the colors and the spike charm look amazing together, and I really loved how it turned it out! You can purchase the charms on Daily Charme website for $1.99! Twitter: Daily CharmeHope all of you enjoyed my post today! What do you guys think? Let me know in the comments below!